India’s Ballistic Missile Defence System: Why should we need it? The Indian Ballistic Missile Defence (BMD) Programme is an attempt to develop and to use a multi-layered ballistic missile defence system to protect from ballistic missile attacks. 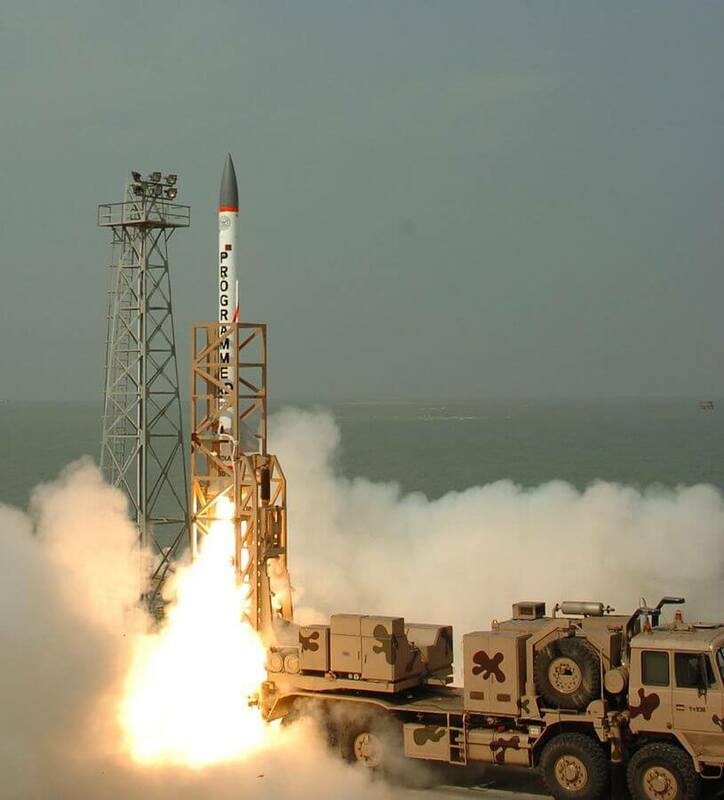 The India’s decision to develop Ballistic Missile Defense (BMD) was introduced in the light of the ballistic missile threat mainly from Pakistan, especially can be attributed to the Kargil War in 1999. A ballistic missile/projectile is one which follows “ballistic trajectory”. The ballistic trajectory is the path followed by the projectile (missile) after thrust forces (propulsion) stop and the projectile are only acted upon by gravity and friction (drag forces). A ballistic missile thus is one which is guided in the initial phase, i.e. lift off, while the rest of the trajectory is dependent on gravity and require minimal guidance. What are the advantages of Ballistic Missile? The have very long range, as they travel above the atmosphere, experience less drag and use gravity and earth’s rotation. They are highly fuel efficient. Only fuel requirements are during lift-off phase and during course correction measures. Multiple independent targetable re-entry vehicles (MIRV) capability can be achieved in ballistic missiles. Due to fuel efficiency, their pay load carrying capacity is significantly more than cruise missiles. What’s Ballistic Missile Defence (BMD) System? A Ballistic Missile Defence system (BMD) is missile defence system that acts as a shield against ballistic missile attacks. You may not that the purpose is defense (by intercepting a ballistic missile) and not attack/offense. Terminal phase: During the atmospheric descent phase. Mid-course interception (in flight interception) – Most preferred interception. Lift off phase– i.e. targeting at launch point- require advance radars. The advance radar system, Early warning system ( Also called sensors system). Integrated command and control center. Interceptor missile batteries- need to be agile, mobile and strategically located on land and sea. India’s BMD development began in 1999, after the Kargil war. The primary aim was to bolster India’s defence against possible nuclear attack from Pakistan. It holds a place of prime importance especially when India follows ‘No first use’ policy. India’s BMD is primarily developed by DRDO with help of many public and private firms like BEL, Astra Microwave, L&T, etc. The first phase aims to develop a shield to intercept missile with a range up to 2000 km. 1st phase radar range is up to 600 km. The second phase will have intercept missile with 5000 km range. Radar range of this phase would be 1500 km. They are Prithvi Air Defence (PAD) and Advanced Air Defence (AAD) respectively. 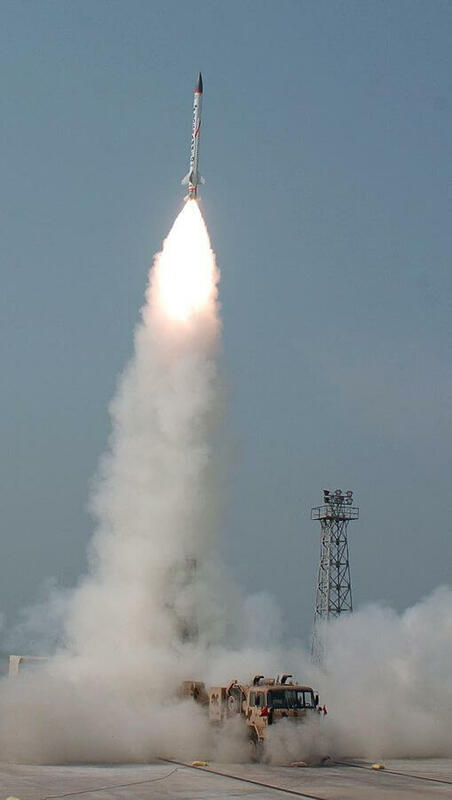 Also referred as Pradyumna Ballistic Missile Interceptor. It’s designed for High altitude interception ( exo-atmospheric interception). Intercept missiles at altitudes between 50 – 80 km. 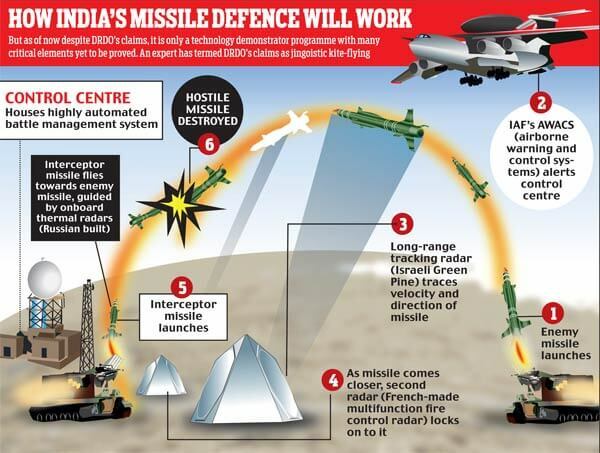 The interceptor is Prithvi Defence Vehicle ( PDV) which has two-stage, both with solid propellants. Also called Ashwin Ballistic Missile Interceptor. It’s endo-atmospheric interception system ( for low altitude interception). Altitude of interception is range up to 30 km. It has single-stage solid fuelled missile. A land and sea-based defence system against all kind of threats. This system is too expensive and requires too much technological and infrastructural development. Though it is the safest configuration, it still isn’t 100% secure. In Second configuration BMD is deployed to protect critical population centres, control and command centres, critical infrastructure centres (including nuclear facility) and major economic zones. It’s strategically and economically more pragmatic than the first configuration. Yet, it is too costly for a nation like India. In the third configuration, protection is provided to command and control centre, nuclear forces and important citizen population centres. BMD will provide protection to command and control centres and nuclear forces and the capital in the fourth configuration. This is the most suitable candidate considering the nascent stage of India’s BMD and also a weak financial condition of the nation. It protects critical nodes of governance as well as of counter- attack. The final configuration would involve BMD deployment only around command and control centre and the capital. Its purpose is only for total defence and not able to provide ability counter attack as nuclear forces are left out of it. Why should India need BMD? India follows ‘No First Use policy‘. A robust BMD provides an opportunity to the nation to strike back if a nuclear projectile is launched by an enemy state. In the past efforts have been made by radicalised non- state fractions in Pakistan to obtain Missile technology. BMD would shield from non-state actors initiated missile warfare and thus could avoid Mutual Destruction trap. India has hostile, nuclear states in its north. 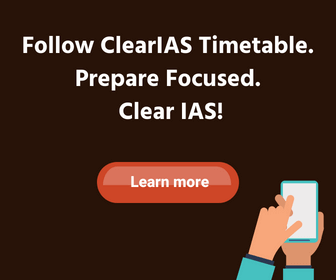 It’s only practical for the nation to prepare in advance. China is developing new technologies to implement its Anti-Access/Area-Denial (A2/AD) strategy in the Western Pacific. It can impact mainland in Indian water. A robust BMD is a proactive measure to tackle China’s A2/AD strategy. BMD reduces the incentive for the enemy state to launch a nuclear attack, Thus enhancing strategic stability. An indigenous system would reduce the import bill of defence systems from other nations. There are side benefits of BMD too, like better reconnaissance, detection, tracking and situation awareness. Technology developed for BMD can be used in other sectors, especially in space technology. It may start the arms race with Pakistan investing in more powerful missiles to thwart BMD disturbing strategic balance. BMD is ineffective against Cruise missiles. Both China and Pakistan have cruise missile capable of delivering the nuclear payload. No BMD can have 100% success rate in the interception of the projectile (ballistic missile). BMD is a very costly affair. For example, U.S. Continental System is estimated to have cost around $100 bn from 2002 onwards. India has a wide and segregated geography. It creates a problem in protection of all critical centre and creation on land infrastructure for BMD in many areas. Even after interception there remain chances of damage, especially if the interception is done in the terminal phase of the ballistic missile. BMD testing is done in controlled atmosphere raising the question on its efficacy in war time. DRDO has been criticised for not releasing whole data related to BMD system. It evokes a sense of suspicion regarding BMD’s capability. In the fast changing geo-political scenario, strategic preparedness and self-reliance are the new currency of defence. BMD fulfills all such criteria and creates a protective shield which has not only physical but also the psychological effect on hostile nations. 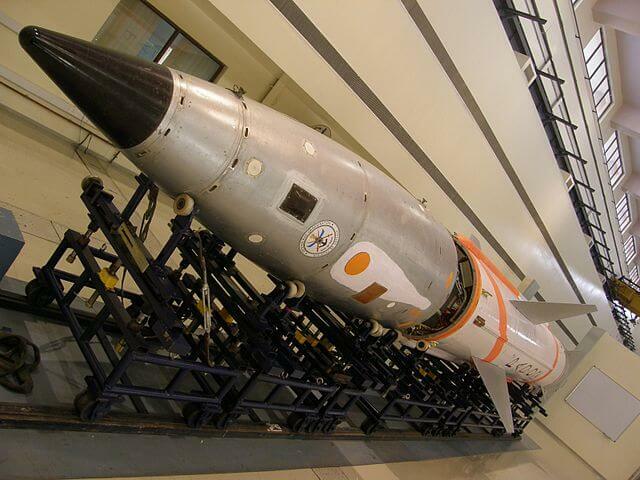 It bolsters India’s NO FIRST USE policy by providing with the second strike capability. 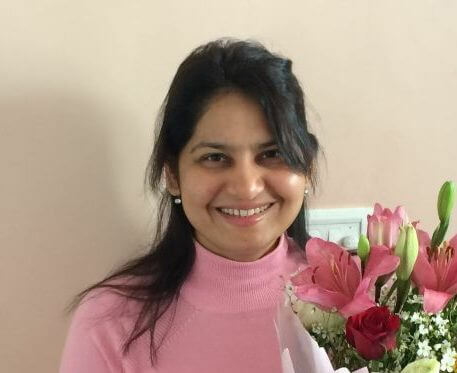 Though there are issues related to its cost, effectiveness, and extent; nevertheless with development in technology and support from Make in India, it has the capability to augment over a period of time. As for now, BMD is an idea whose time has come and will remain so for a long.